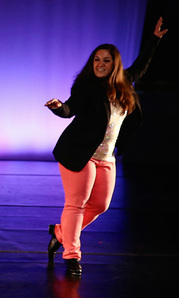 Theresa DeSimone is a tap dancer and choreographer originally from the Philadelphia area. Raised in Maryland, she studied at Elower-Sicilia Productions and had the privilege of dancing as an undergraduate with the DC Artistry Tap & Drum Ensemble. Her critically acclaimed choreography for “Soles in the Raw," performed by The Lady Hoofers, was selected in 2014 for the Koresh Come Together Festival at the Suzanne Roberts Theatre as well as The Outlet Dance Project, a festival of female choreographers at Grounds for Sculpture. Lewis Whittington of Dance Journal describes the rendering as taking “tap in unexpected directions.” Theresa has performed at various Philadelphia theaters, and her choreography has been showcased at venues such as the Kimmel Center, the Trocadero Theatre, the Painted Bride Art Center, and the Forrest Theatre. Devoted to her continued growth as a dancer and musician, she can be found in workshops and professional tap classes across the country. Theresa is also a Pediatric Nurse Practitioner. Theresa was a First Company Dancer with The Lady Hoofers from 2012-2015 and the ensemble continues to perform her choreography in "A Little Party" and "Most Wonderful Time of the Year."